Using my dog Jasper as my muse . . . I did this page for an online digital class I took last November. 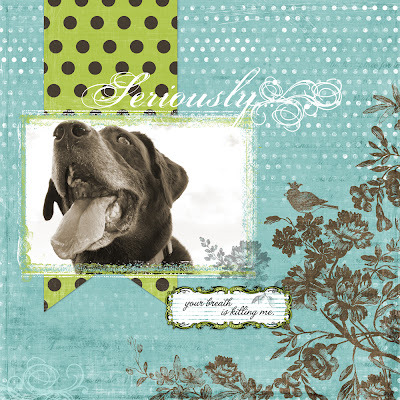 I've been reading a lot about digital scrapbooking and hybrid scrapbooking lately. People have done some really wonderful things, and unfortunately for my poor designer eyes, some really horrible things. No, no, take it away as I shudder in horror and can't help but show it to my designer friends so we can cringe together. It's kind of like tasting bad milk and handing it to your roommate and saying, "Does this taste bad to you? By no means do I sell myself as a great scrapbooker, but I do fancy myself as a fair graphic designer. And as a designer, I really think we all can enter the digital world with GREAT success if we all learn how to use digital tools correctly. I really recommend this site. Jessica Sprague has a lot of great training tools on her blog. Not to mention fantastic design. More to come I hope. The problem with blogging is I can't rip it up and burn it like those old humiliating journals I wrote so long ago. Hmmm.